In these still early hours following the mystery crash of MH17, one must dare to think the unthinkable. An investigator goes to where the evidence leads, and the evidence so far from the crash site indicates a hellish scenario beyond imagining. 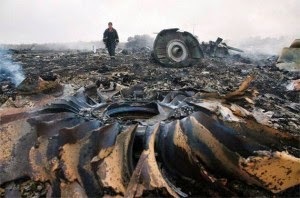 Besides the nearly 300 passengers aboard the ill-fated Malaysian Airlines, the plane’s cargo bay was loaded with dozens of infected corpses drained of their blood and countless packets of possibly virus-contaminated blood serum, according to the local eyewitnesses, first-arrivers at the crash site in the Donetsk region along Ukraine-Russia borderlands. The gruesome finding points irrefutably to Malthusian skulduggery at the highest levels of the World Health Organization (WHO) in sponsoring a covert biological warfare program against the population of Asia. A systematic investigation is now required to uncover the deadliest plot against humanity in modern history. The more predictable outcome, unfortunately, is likely to be a cover-up on an unprecedented scale to protect the globalist elite from scrutiny, legal prosecution and justice. The blatant violation of international laws for transporting infectious agents indicates a criminal intent in their use at destination. IATA, the watchdog agency for air travel, strictly controls and registration rules in the conveyance of corpses and infectious substances due to the dangers of accidental spillage or deliberate biowarfare. The WHO also imposes tight reporting rules for physical transfer of materials between laboratories, and is therefore now caught in flagrante delicto violating its own rules. The notable failure by the Israeli-controlled Amsterdam-Schiphol Airport customs clearance, in addition to the WHO and IATA, to warn emergency crews and investigators at the crash site of the epidemic danger proves that the gruesome cargo was transported illegally without registration. The UN and WHO are directly implicated in this covert transfer of biowarfare agents in the cargo hold, accompanying some 100 of their top virus researchers, staff members and NGO supporters in the passenger cabin. According to rebel commander Igor Girson, who goes by the nom de guerre Strelkov, as quoted by AP, reported that local villagers who rushed to the crash scene found “a significant number of the bodies weren't fresh.” The first-responders also said the corpses had been drained of blood and reeked of decomposition. Could the cadavers have been air-freighted for simple anatomy classes? That is a freshman question. Paying air-cargo fees to send bodies to Asia is more of a financial loss than sending coals to Newcastle. There is no shortage of fresh John Does on ice from places like the Philippines. Drained of blood and reeking from decay, the corpses can be nothing other than carriers of an infectious disease. Decomposed cadavers and tainted blood exposed to wind, soil and ground water pose a present and clear threat to public health for millions of people across Ukraine, western Russia and the countries of the Black Sea, including Moldova, Turkey and even as far as Greece. A regional warning needs to be issued, but none is forthcoming, not when the WHO is implicated while its executives, the hidden elitist sponsors of genocide, scramble for the cover of respectability. These reprobates nestled in the medical bureaucracy are far ;worse than ordinary war criminals. In a worst-case scenario, and the facts thus far point to a hair’s breadth short of worst case, the MH17 crash on the Ukraine-Russian borderlands could have been the start of a real World War Z. Conversely the shoot-down could have been an act of twisted heroism in a desperate last-minute strike to prevent biological warfare on a global scale. One question logically raised is whether the transport of infected corpses and tainted blood to host countries can be a standard feature of the UNAIDS conferences. Serving as a medical-science reporter with The University of Hong Kong press, I reported extensively on UNAIDS 2001 in that that city and visited the top research university laboratories. I can attest that bodies and blood samples were not obtained as part of the proceedings, and precautionary procedures for the sharing of tiny bits of samples were always followed to a tee. The WHO was shipping its “zombie” passengers for a criminal purpose, very possibly genocide on a wide scale, perhaps continental. Blood-drained corpses are the stuff of horror movies, but this nightmare arose from one of the busiest airports of “civilized” Europe, and one controlled by ITCS, a security company linked from its inception to the Israeli Mossad. A reason for concern, early in this investigation, is the fact that The Netherlands, the origin of of Flight 17, is the center for the engineering of weaponized viruses under Ron Fouchier, the closest research associate of the notorious Japanese influenza expert Yoshihiro Kawaoka. The flu-research center at Eramus Medical University in Rotterdam is the sister-laboratory of Kawaoka’s Institute of Infectious Virus Research at the University of Wisconsin, Madison. Kawaoka and Fouchier are not mad scientists working on the fringe, they are accredited researchers with powerful funding support. Two years agi, the twin labs received a massive boost in funding from unidentified sources funneled through department budgets despite vociferous objections from other scientists as to the unstoppable risks. The patrons of the deadly research includes the chairman of the Eramus University trustee board, Anton Van Rossum, a former executive with Solvay, the Belgium chemical producer that illegally provided sarin-gas components to the Israeli biowarfare program aboard an El Al jetliner that crashed in Amsterdam. The El Al flight hit a crowded apartment block, soon after takeoff from Schiphol Airport, which also is the takeoff point for MH17. - the midsection was “blown outward and not inward,” indicating a bomb blast inside the cargo bay. The expert observations, when assembled, shows that a NATO interceptor fired a heat-seeking missile at a jet engine, triggering a fire. The flames were expected to move up the fuel lines inside the wing to set fire to the plane and incinerate all contents, especially the infected corpses and blood packets. The midair disinfection plan came undone when a bomb hidden inside the cargo bay by the Israelis, timed to explode at Kuala Lumpur International Airport (KLIA) to spread biowarfare agents after all the passengers debarked safely, instead heated up and burst midair. The bomb blast blew out the on-board fire before the cargo was torched. The plane plummeted to the ground with the biowarfare agents and corpses intact. President Vladimir Putin, out of character, did not react forcefully to the accusations of a Russian role in the shoot-down, indicating military commands of NATO and Russia are on the same page in their determination to stop the Israeli-inspired, WHO-backed bioweapons attack against the world population. The other question now, besides decontamination, is: How to track down and punish the perpetrators and planners who were not aboard MH17? The Ukrainian side, which lacks any of the intelligence professionalism required for these sorts of code-red operations, bungled their version of events and clumsily imposed a communications blackout over the control tower at Kiev Airport. Preventing global genocide is not a task for Cub Scouts out to protect their petty national interests. Imperial powers are far more astute at the deadly game, which is why they are empires and mere nations. The threat of World War Z is not over, not when Ukrainians and Russians are being exposed to the unleashed viruses that defy inoculation with vaccines. Trained biowarfare experts in safety suits should collect the evidence and torch the bodies in a mobile plasma incinerator. By the time the clean-up is finished, Eastern Ukraine could end up as uninhabited as the central Congo after WHO teams eliminated all potential carriers of ebola. The world’s population has practically zero awareness of the well-hidden strategists who plan and order annihilation of entire regions, as has been happening with the ebola campaign and AIDS in Central Africa, or the Factor VIII HIV-tainted blood propagation to the war-torn Balkans and Japan under the Clinton and Bush administrations. This summer another brazen biowarfare attack was within a razor’s edge of exterminating Malaysians and millions of other Asians. Yoichi Shimatsu is a science writer, who organized public health seminars during the SARS and avian influenza outbreaks in Hong Kong and Bangkok. He was the lead investigative journalist in the 1995 Tokyo subway gassing and subsequent terrorist threats against Japan’s nuclear reactors. His article on the Amsterdam crash of an El Al cargo jet loaded with bioweapons, sarin and war-grade plutonium follows this article. (PNS) AMSTERDAM -- The Dutch Parliament is just this month holding public hearings to determine vital facts about an October, 1992 airplane accident. The El Al Boeing 747 crashed into an apartment building in Bijlmeer, a suburb of Amsterdam, killing 39 people on the ground and four aboard the plane. It was carrying a secret cargo that included the main chemical ingredients for the nerve gas sarin as well as depleted uranium. Dutch journalists allege it was carrying weapons-grade plutonium as well. The hearings at The Hague follow six years of investigation by Dutch journalists Vincent Dekker and Pierre Heyboer with the Volkskrant newspaper. The most important witnesses will not be present, however -- officials of the Bush administration. The flight stopped at Amsterdam's Schiphol Airport for refueling en route from New York to Tel Aviv. On October 4 last year, the sixth anniversary of the crash, Dutch transport ministry leaked to a newspaper an El Al bill of landing that shows the plane was carrying 190 liters of dimethy methylphosphonate (DMMP), four liters of isopropanol and an undisclosed amount of hydroflouric acid. The chemicals were being sent to a super-secret weapons facility, called the Israel Institute of Biological Research (IIBR) south of Tel Aviv. The Israeli government has claimed that the chemicals were intended for testing gas masks. But most military services use only a few grams for such purposes. The chemicals aboard the El Al jet were enough to produce 270 kilograms of sarin nerve gas -- enough to annihilate the populations of many major cities. The sarin components came from the Solkatronics chemical plant in Morrisville, Pennsylvania, then owned by Solvay, a chemical corporation based in Brussels, Belgium. International transport of such materials is a violation of the Chemical Weapons Treaty, signed by the U.S. The El Al jet also carried at least 800 kilograms of depleted uranium (DU), used as ballast to balance the jet's cargo. Burned DU releases uranium dust, which is known to cause lung cancer and other diseases. The El Al jet landed and took off at Schiphol, one of the world's busiest civilian airports, and flew across the most densely populated area of Europe. If 27 kilograms of plutonium had bounced into the burning wreckage, nearly all of Western Europe would have faced a nuclear emergency bigger than the Chernobyl accident. Dutch and Israeli authorities apparently organized a cover-up. Most documents taken from El Al officials have disappeared. Police audio tapes and 42 videotapes taken by the firefighters were shredded. Firemen claimed that they turned in the cockpit voice recorder, or "black box," but the government denies that it was ever found. Metal parts from the wreckage were recycled and melted down before a proper investigation could begin. Journalists say Dutch security officials have told them that the Netherlands has allowed Israel to make secret military air shipments through Schiphol since the 1950s. The shipments apparently are outside the Atlantic Alliance military treaties because the aircraft going to Israel are not refueled at NATO air bases but at the commercial airport of Schiphol. "Schiphol has become a hub for secret weapons transfers because El Al has special status there. Dutch authorities have no jurisdiction over Israeli activities at the airport," said Henk van der Belt, a member of an investigation team set up by Bijlmeer residents. Every Sunday at sundown, an El Al cargo plane stops at Schiphol, refueling midway on the long journey between New York and Tel Aviv. All Israel-bound cargo is put inside a vacuum chamber in an underground bunker to test it for bombs equipped with altimeter triggers. But the flight does not appear on any airport video monitors -- there is not even an El Al check-in counter. Documents for air freight to Israel are handled inside an unmarked room. Airport workers in Cologne, Germany, where the jet refueled on its way to New York, say the plane collided with an airport ground vehicle there. In other words, the cargo jet loaded with U.S.-made sarin, uranium and plutonium could have crashed in New York but it turned out to be a time-bomb flying to the heart of Europe.